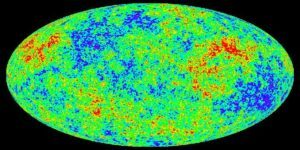 The NASA image below of the Cosmic Microwave Background (CMB) is indicative of the state of the early universe, in the plasma soup, at the beginning. Here, the colors are an indication of the type of radiation, i.e. the element and the temperature. Comparing to a coil on an electric range, cooler is dark and as the coil heats the color changes to red. Using the element in an incandescent light bulb as a further example, if allowed to go uncontrolled, the color would become yellow and then white. Under laboratory controlled conditions the color variation would go from yellow to blue, and then green as it grows hotter. All of these colors are present at various locations of the CMB. The actual spectrum that we see is affected by redshift, due the the movement away from the observer. Noise from the radiation of the CMB is what we hear as background on AM radios. FM bandwidth is away from this spectrum, hence not heard. The standard model of the origin assumes that helium (He) and heavy hydrogen (deuterium H2) appeared from the plasma as it cooled. In the early plasma state it is assumed to have been a full ionized gas at a very high temperature. As it cools, charged particles emerge which act to initiate the formation of hydrogen and helium and then oxygen, as the electrons are able to combine with the other fields. The electronic charge of the atom is determined by the relative number of electrons and protons and the polarity is a result of the combined atomic spins of the electrons in orbit around the nucleus. Electrical charge and magnetic polarity play an important role in the early formation of the molecular clouds. These clouds of elements in the form of molecular clouds, combined with dust to fill the space in the cosmos, but not uniformly. The molecular clouds formed first a cosmic structure looking somewhat like a sponge, with dark matter, gas and galaxies outlining sparse voids. These clumps are protostars, where stars initiate. Interestingly, the smell of space is reported by astronauts to be like burned carbon (Popular Science, July 18, 2013). Space primarily consists of low density gas and dust with about 75% of the mass of the gas being hydrogen and 25 % helium. Traces of other elements are found. The dust is very fine particles, comparable to cigaret smoke. The gas and dust is not uniformly distributed with a complex mixture of cool dense clouds twisted in tangles of hot low density gas. Water in the form of ice is found. Star formation in the galaxies began in a manner analogous to water condensing in clouds and generating raindrops. These clumps of matter had different densities and those with similar properties tended to group together with gravity as the main driving force. Accretion from the molecule generated an atomic buzz that further drove the clumps of molecular gas and dust to associate. The violent associations generated shock waves which, in the presence of strong magnetic fields, initiated the formation of light sources or stars. Stars would typically form in the spiral arms of galaxies such as M83, near the center of the top banner, and M51 in the photo gallery. The NASA image below well illustrates the sequence of events involved in the formation of the cosmos. The sequence as described above for star birth was recently captured by an amateur astronomer in Argentina. In the presentation below, the final result is shown in the first image but his sequential photos are shown in the second, black and white series. The black dot which appears at lower right is the birth caused by the passage of a shock wave through the seeded field. Neutron stars form as giant atomic nuclei with essentially no vacant space and the density is essentially that of an atomic nucleus. They emit radio waves as well as x-ray and gamma ray radiation. They are discovered by radio telescopes rather that optical telescopes. Rapidly rotating neutron stars emit a regular signal as the star rotates. Radiation from the rotating Crab pulsar gives signals at 30 per second. Neutron stars can typically have masses of many solar masses, i.e. many times greater than our sun. Early on astronomers discovered that the universe was expanding, driven by gravitational repulsion. The amount of mass required to cause that acceleration observed was many times the mass expected from planets, dust and other observed matter. The term dark matter was assumed to associate with this missing mass. “Black hole” is the name given to the location in space time where extraordinary mass has accumulated due to immense gravitational attraction. The gravity concentration of a black hole builds from a neutron star as it attracts more mass from the surrounding dust etc, of the cosmos. Masses of 10 to 25 solar masses occur here. As the black hole attracts more mass, and the mass reaches from 40 to 100 solar masses, any gasses are purged, increasing the density. Galaxies typically have black holes at their center.. Collapsing neutron stars are central to the galaxy central masses (bulge) and, as a result, to the velocity of the stars spinning around them. This is most notable to galaxies having the classic central bulge. Our universe is defined by the millions of galaxies which are seen by telescopes. The universe appears to be flat and expanding with the galaxies accelerating away from each other, driven by reactions to dark matter, which constitutes an overwhelmingly large portion of the matter of the universe. There is no spacial center, no origin. The calculation of the age of the universe can be accomplished with a velocity for two different galaxies and the distance between them. We have millions of galaxies from which to choose and modern astronomical telescopes have given the required velocities and distances. Velocities are measured by redshift, which is the astronomical adaptation of the doppler shift effect found in sound when a train horn appears to change frequency as it passes. Distances are established by using the parallax principle and the comparative luminosity of the parent stars. 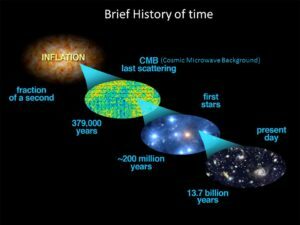 The generally accepted value for the age of the universe is 13.8 billion years (Seeds, M. A and Blackman, D. E, 1010) (Seeking the Cosmic Dawn).